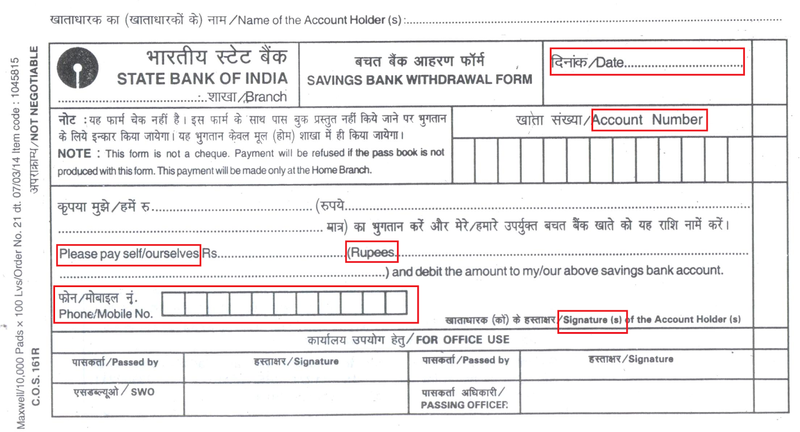 If you don't know how to fill up SBI Pay In Slip or cash withdrawal slip, here is a guide to learn how can you fill that form. 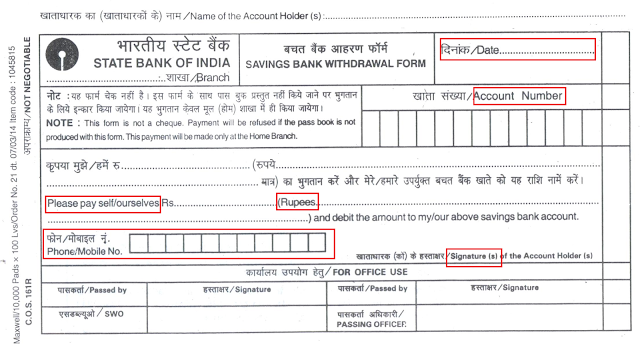 In the withdrawal slip, you have to fill up all details and put your signature as it is in the bank record. You need to submit your passbook too along with pay-in slip / withdrawal slip so that your cash will be given to you. So please don't forget to carry your passbook along with when you go to the bank. Here are the steps you have you have to follow for filling up the SBI withdrawal slip form. 1. Branch: You have to write your SBI branch here. Suppose, if it is Kovilpatti, You have to write it in the appropriate place. 3. Account Number: Write your full account number here. You have to carefully write your number in the box provided. One number should be written in one box. If you don't remember your account number, see your passbook to avoid mistakes. 5. Phone / Mobile Number: You have to write here your mobile number. Better to write the registered mobile number and active mobile number. 6. Signature (s) of the account holder (s) _____________: Here put your signature. If it is joint account holder, all members of joint account should sign here. There will be a section for Office Use. You should NOT write anything here. This is for SBI bank officers only. They will fill-up and and process your slip to withdraw the amount you mentioned. You have to fill the form as instructed and submit to the bank officer. You will be given a token as the application received. You will be given your cash when your turn comes. Thank you!